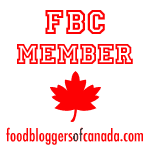 All good things must come to an end, and that includes my little adventure with Dairy Farmers of Canada’s Cheese of the Month Club. There’s nothing quite like receiving a lovely new Canadian cheese on my doorstep each month! I’ve discovered all kinds of wonderful new cheeses from coast to coast, some of which I was already familiar with, and some of which were completely brand-new to me. I’m guessing the lovely folks at DFC like to go out with a bang, because this month, we got an extra surprise in our delivery… TWO cheeses! 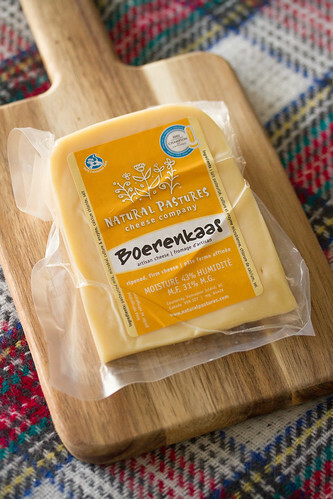 The first of our featured cheeses is Boerenkaas, a semi-soft Dutch-style cheese. It’s made by Natural Pastures in BC’s Comox Valley using milk from local farms, and aged for 6 months to give it its smooth, creamy flavour and slightly crumbly texture. 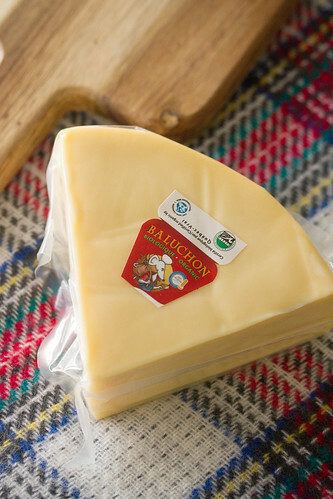 The second cheese is Baluchon, the namesake cheese from Québec’s Fromagerie Baluchon, one of the few producers to be certified organic by Québec Vrai. It’s a creamy semi-soft cow’s milk cheese with a salty, buttery flavour and a smooth texture. 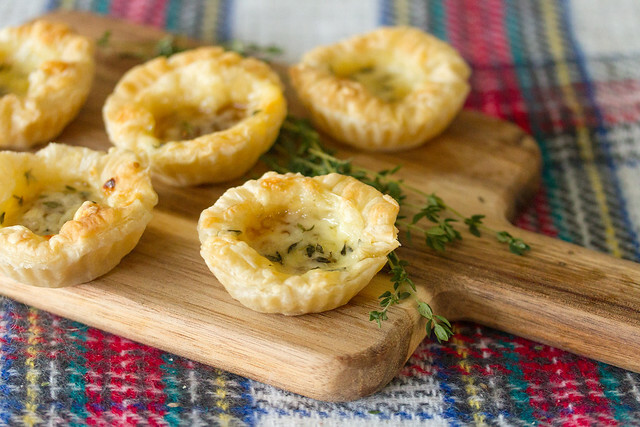 With the holidays around the corner, I decided to use my cheeses to make simple puff pastry tartlets. 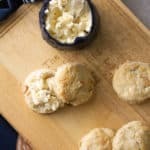 These little bite-sized treats are perfect for serving as a pre-dinner nibble for hungry guests, or as part of a larger spread of finger foods for a holiday cocktail party. I’ve used fig jam because it’s a favourite of mine, but these are equally tasty with cherry jam or even leftover cranberry sauce. 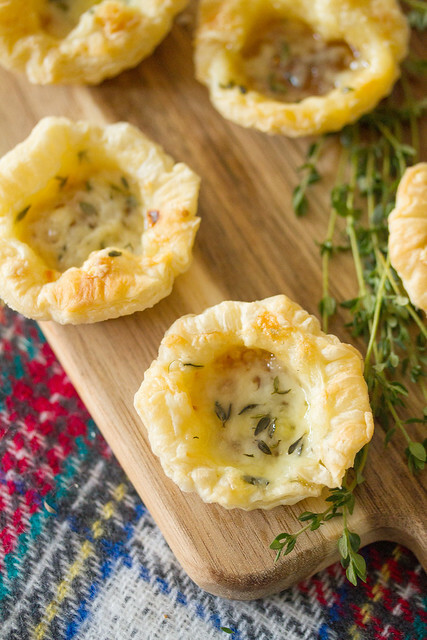 A pinch of fresh thyme keeps these firmly in savoury territory. I’m very sad to say goodbye to receiving a little surprise at my door, but I plan on continuing on with this project by trying out a new-to-me Canadian cheese each and every month in 2018. Pretty sure that’s one New Year’s resolution I won’t have any trouble at all keeping up with! This easy four-ingredient appetizer is a cinch to make. If you don’t have fig jam kicking around, feel free to substitute with whatever you have on hand. I’m partial to fig, but sour cherry or apricot are both quite lovely as well! On a lightly floured work surface, roll out the puff pastry into a 12” x 9” rectangle. Using a 3” round cutter or a drinking glass, cut out 12 rounds. 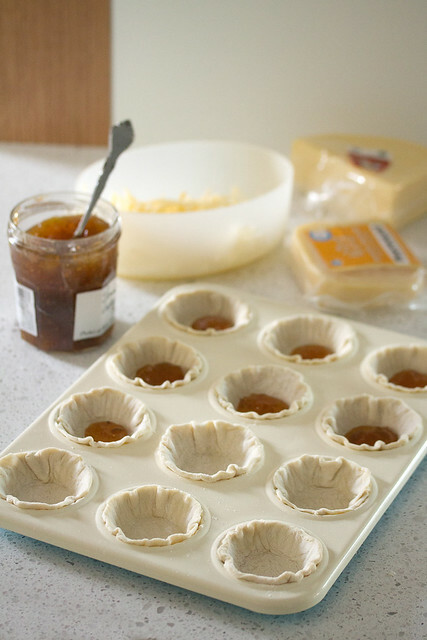 Gently press the pastry rounds into a tartlet pan (or, if you don’t have one, you can use a regular muffin tin instead). Spoon 1 tbsp. fig jam into each tart. Top with the grated cheese, and then finish with a sprinkling of thyme leaves. Bake in preheated oven for 15-20 minutes or until the pastry is golden brown and cheese is melted and bubbly. Cool in the pan for 5 minutes before serving. I love cheese. 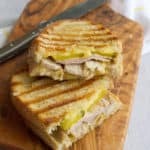 These look really good, I will have to try and make some. Fig and cheese. PERFECT. I mean, I’m a pretty big proponent of fruits and cheeses being paired in any case (I make an apricot butter that I could eat with cheese all day), but this particular combination looks and sounds absolutely fantastic. I’d have to exercise some seeeeerious self-control to avoid eating a dozen of these in one go. 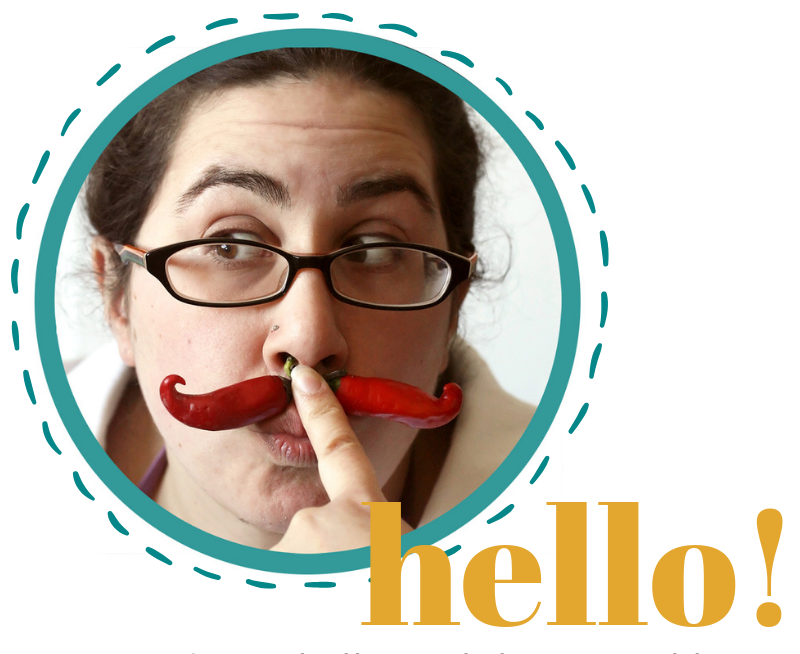 I’ve really enjoyed your recipes with DFC! Can’t wait to see what new adventures are in store for 2018. That looks so good, and Baluchon is one of my favourite cheeses!!! You lucky you! I can’t believe that these are so easy to make! They are super cute and I bet they taste amazing! Wow, these tartlets look so delicious!! I’m definitely going to give it a try. Can’t wait! Love those flavour combinations! I like anything with fig (and cheese, of course) at any time of year, but these are perfect little bites for the holidays! 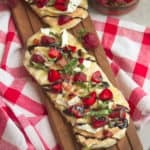 This looks delicious-I love the combo of fig and cheese. I’d sure be sad to be saying ‘bye’ to a new cheese on my doorstep every month too! Merry Christmas! I love combining cheese and jam and this is such a lovely way to do it. 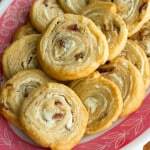 These would make a great holiday appetizer! They’re so pretty and delicate! What fun to “have” to try out cheeses for months on end!